How about a light and healthy breakfast that’s also filling? 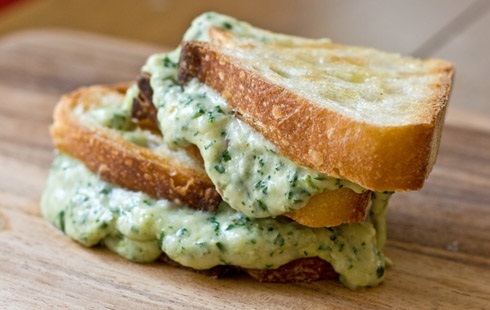 Create a delicious combo of fresh herbs, olive oil, and cheese and smack that stuffing into bread slices. Grill to perfection and serve hot for a yummy breakfast your kids will absolutely adore you for. This Cheese ‘n’ Herb Grilled Sandwich is easy to make and brings quite a refreshing change to your morning menu. Grind the garlic clove into a coarse paste. Add all the herbs, lime zest, mustard and half of the cheese to the garlic paste and grind in a food processor until well blended. Take this mixture out in a bowl and add the remaining cheese to this. Apply this mixture on one side of each bread slice and cover with the other slice. Brush the top of the sandwich with a little olive oil and grill it on medium-high heat for 5 – 6 minutes or until the bread is toasted and the cheese melts.